TWIRL CELEBRATES || Happy Birthday, Ty!! TWIRL CELEBRATES || HAPPY BIRTHDAY, TY! Today is one of our favorite days of the year! It's our beloved Ty McBrayer's birthday!!! Ty's life makes this world a better place and therefore is worth celebrating in abundance. We thought it'd be sweet to gather together how Ty's life and love has impacted the hearts on our team and celebrate her in that way. We put these all together for a little book for her but we thought we'd share them with y'all too and encourage you to leave some love in the comments below! WE LOVE YOU, TY!! HAPPIEST OF BIRTHDAYS!!! Cheers to the legacies of beauty & love your life is cultivating, Ty! We are so grateful!! As soon as I got engaged, my best friend Ashley Booth immediately suggested that she would take me to meet Heidi Elnora to get my wedding gown designed. I was SO excited! Heidi had designed some amazing pieces for Ashley to wear when she competed at Miss USA as Miss TN. They had become close over the years, so I was honored to meet this little southern bell Ashley had spoken so highly about. I had watched Heidi on Project Runway, so I was thinking I was also going to be a bit star struck! I never dreamed I would be able to wear a custom gown for my wedding, so I was just blown away at even thinking about the process! I had worn several different gowns through my year as Miss KY and while modeling, and so I had learned a lot about what I wanted. However I was unsure of what to do to make it look right without it going over the top. That’s where Heidi came in. I love SO many different aspects of several very different gowns, that it came to the point that I literally said…”Heidi… how can I keep from making this look like a gown that’s just way over the top, with too much going?” It was a bit overwhelming to have an endless amount of options and I was so relieved she was such an expert to help through the process. She wanted to know all the details of my wedding and to really get to know me so she can make a dress that was 100% Maria. Taking the time to do that really showed that she cared about each and every bride’s big day, even though she does this day after day. Instantly when I walked into Heidi’s Atelier in Birmingham, I could feel the southern hospitality. Heidi’s warm heart just completely filled the room! I felt at home even though I just met her! After lots of laughter and immediately feeling like I had known Heidi for my whole life, I tried on several different body styles from her Build a Bride collection. I instantly knew I wanted a trumpet skirt. I wanted something fitted, but not tight all the way to my knees like a mermaid style - but something that was still body shaping with a flowy bottom. So we had decided on the bodice, called The Mary Margaret dress (all of Heidi’s dresses have doubles names to stay true to her Southern brand). We then moved onto lace. Here is when I began getting amazed at just how much Heidi listens and truly reads bride’s minds. She knew the exact lace I would want for my whimsical outdoor wedding. I LOVED the lace she showed me, The Mary Lace. I have never seen lace look so soft and not-over the top formal, just as I wanted. Even after looking through the other lace options I realized she was right! That was the perfect choice! Lastly, I wanted to add a little bit of natural, organic looking texture to the bottom of the dress because I LOVE texture on gowns. Once again – she knew EXACTLY what I meant. She had a skirt named the Sophie skirt which had bits and pieces of lace and organza organically hand sewn on it. This gives the skirt natural movement and beautiful texture. However, it was made to sit on a transparent, flowy A-line skirt. I instead was picturing these pieces attached to the form-fitting bodice. When I brought this up to her, she responded “Oh absolutely!” She was thrilled at my idea of changing one of her pieces from the Build a Bride line! I loved her enthusiasm! Even though it was going to require more hard work, she wanted to do it because it was ultimately my dream gown. The whole ‘designing’ process literally took about 5 minutes. I’ll never forget Heidi saying “I really wish I could make it more of a process for you, but I think we are done!” Haha! And she was right! That’s the benefit of the Build a Bride Collection. I had the pieces to choose from right in front of me, which took out the guess work of designing my gown because I could see them! That’s why I fell in love with the Build a Bride line! And plus, when a designer just knows how to design so well and listens to the bride as she does, it makes designing your gown so much easier! When it came time to do my fitting I was blown away by how much of ‘the most important dress of my life’ was made before my eyes. I watched two of the sweetest ladies ever, Karen and Elizabeth, hand sew each tiny piece from the Sophia skirt onto my dress. I even got to help a little! (which is not mandatory for all brides of course! But I had grown close with the Heidi Elnora family and was excited to jump in for sewing one tiny triangle…which I’m sure Karen had to re-stitch after I left). It was coming together beautifully. I really loved the fact that yes, although the Sophie Skirt was hand made in Paris, the bodice was made in Alabama, and they were sewn together before my eyes. That is just an example of how pure hearted Heidi is. She wants to take care of Birmingham, her hometown, by keeping as much instate as possible while adding exquisite quality from Paris. She also never left Birmingham, even after being on Project Runway & having her own TV show, Bride by Design, on TLC. I’m usually a pretty introverted person, but when I finally got to put on the dress of my dreams…. I was brought to tears! So unlike me! As I stared at myself in the mirror, Heidi put a dreamy, cathedral length, simple veil in my hair and then she literally hoped to sit on the floor to continue fidgeting with the pieces that hung off the skirt herself. She wanted each one placed non symmetrical on both sides, so that it had the outdoorsy, whimsical look I wanted. She really contemplated the placement of each one and started repining a few of them. I just loved how much she poured her heart and soul into making it just right, even after it was ‘done’! The strapless, sweetheart cut dress fit like a glove! But yet the fabric was so light weight, and ultimately proved to stay light weight in the 85 degree weather we had at our Danville, KY outdoor wedding! The gown even completely stood in place, although it was strapless. Again, I have probably worn thousands of strapless gowns through my years of modeling and many of them eventually fall down and need pulled up on top. Not mine! I danced the night away with it secure as can be thanks to the boning Heidi places in each gown for ultimate shaping and security. I got to know Heidi better as time went on as I joined her and my friend Ashely modeling in photo shoots. They are without a doubt some of my favorite pictures of my whole career! Brittany Massey is amazing with hair and makeup, and Angela Karen just takes the prettiest pictures! Not to mention the gowns are of course…to die for! The Heidi Elnora family is truly one of my favorite blessings of my life. But at the end of the day, I’m still just amazed that Heidi stays as humble as can be despite the fact that when we walk around in AL, New York, or anywhere else that people never stop requesting photos with Heidi and being star struck themselves. She is without a doubt one of the most down to Earth girls I know, and will make you feel like she is your big sister. I couldn’t have received a more beautiful, comfortable, custom-gown, at a great price, for the biggest day of my life. Thank you Heidi & all your team! Meant To Be Boutique | Coming Soon! 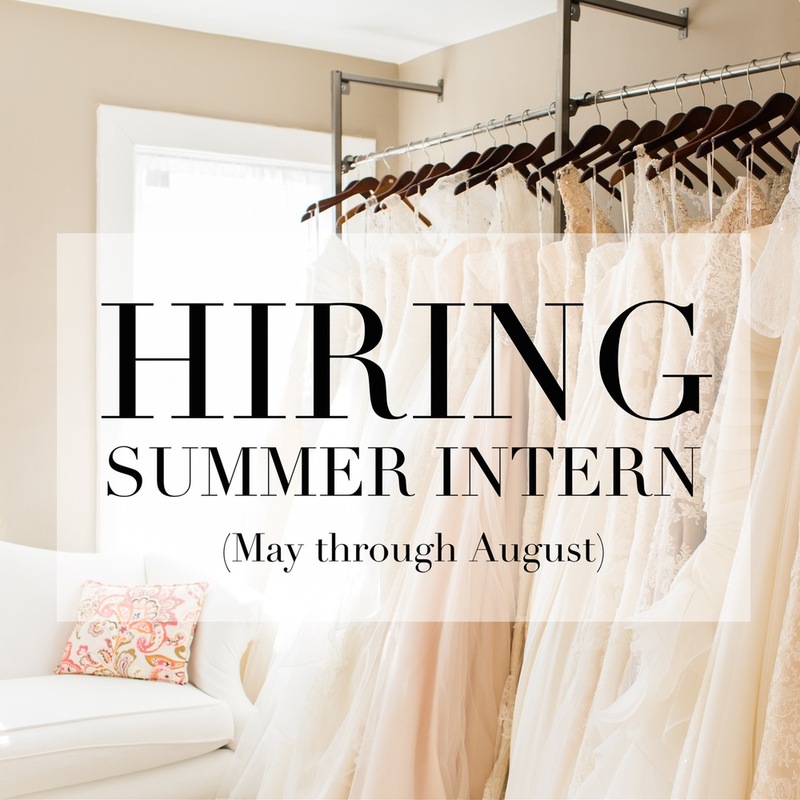 If you or someone you know is interested in selling their wedding dress, please email us at hello@meanttobeboutique.com . We are looking forward to this new adventure and are so thankful for all of you who have already cheered us on as we chase this dream of ours! Attention Twirl girls! Planning a wedding is hard, right? There are so many things to take into consideration. Who are your bridesmaids going to be? How will you find that perfect dress, venue or cake? You have to think about the ceremony, the pictures, reception, decorations, food, hair, makeup…and the list goes on and on. One thing that most brides have in the back of their mind is that they want to lose a few pounds to look their best on their “Big Day.” Well, lucky for you, Twirl is now offering a service to help brides reach their fitness/wellness goals. Whether you want to tone up or lose weight, take advantage of a free consultation with “Wedding Veils and Barbells” and see what this is about. Hello, my name is Hannah Slone. I am a graduate from Georgetown College and have obtained a Bachelor of Science Degree in Exercise Science and a minor in Psychology. My passion is to help women see their full potential and achieve their fitness goals. I view losing weight not just as a “fad” or “crash” diet, but as a change of lifestyle to becoming a healthier and happier individual. For most ladies, our wedding day is something we have played out in our mind and daydreamed about since we were little girls—It’s a “Big Day.” Possibly the biggest day of our lives, or at least in the top five. No one wants to look back 5, 10 or 15 years down the road at wedding pictures and think, “Wow…I should have toned up that arm flab,” or “I remember not being able to eat one bite at the reception because if I would have, the buttons on the back of my dress would have popped off.” To avoid these regrets, let me introduce you to a few options that are now being offered through Twirl. Congratulations…Since you are a Twirl bride, you are entitled to a free wellness consultation and a discount on a wellness/fitness-consulting package by me. Once you have contacted me, we will schedule a time to meet that works with your schedule to discuss the best package for you, as well as your personal health goals. After we meet, you will begin to receive detailed meal plans and exercise routines that can be done in the comfort of your own home. - Bride Only: Customized weight loss plans just for you! - Bride and Guest of Choice: It’s not easy losing weight alone, right? This package allows the bride and guest of her choice to enjoy this weight loss journey together. - Bride and Groom: Think of this as a bonding experience between you and your future husband. - Bride & Bridal Party: This is our special package upon request! Have fun losing weight with all your best friends and encouraging one another. This makes a great bridesmaid gift. Lastly, I can’t wait to start this journey with you. I strive to be more than just a fitness consultant but a friend and accountability partner along the way. I care about your goals and wishes for your “Big Day”, as well as a lasting lifestyle change. Call or email me at 606-922-2780, weddingveilsandbarbells@gmail.com to discuss this in more detail and find out how and when to get started. If you've been following along with us on social media you've probably noticed that Twirl got a little facelift recently! We'd been wanting to do this for a long time but it wasn't until a few weeks ago that we finally bit the bullet and went for it. Oh goodness, it is a DREAM! We absolutely LOVE the new look of the store and we hope y'all do too! Here's a peek into the renovation of our sweet little shop. Our amazing custom desk/shelving unit was created by Mulberry Builders and we're absolutely IN LOVE with it! They do incredible work. We couldn't be more pleased! 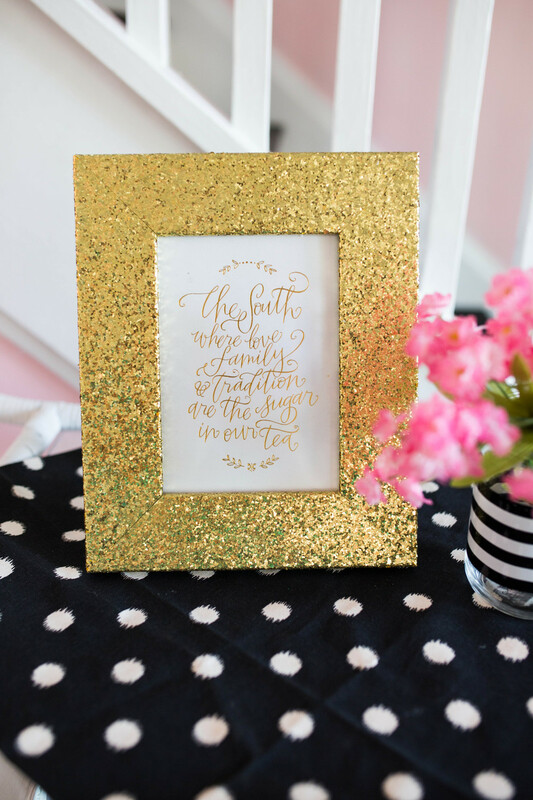 Gold desk & shelf decorations are from Hobby Lobby. We're a littttle obsessed with gold. 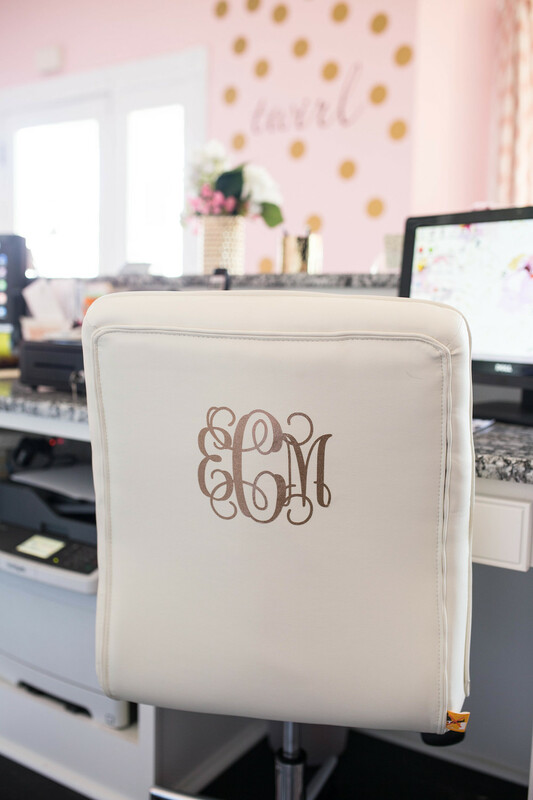 Gold vinyl monograms (TSM is Ty & EMC is Liz) from Dixieland Monogram. 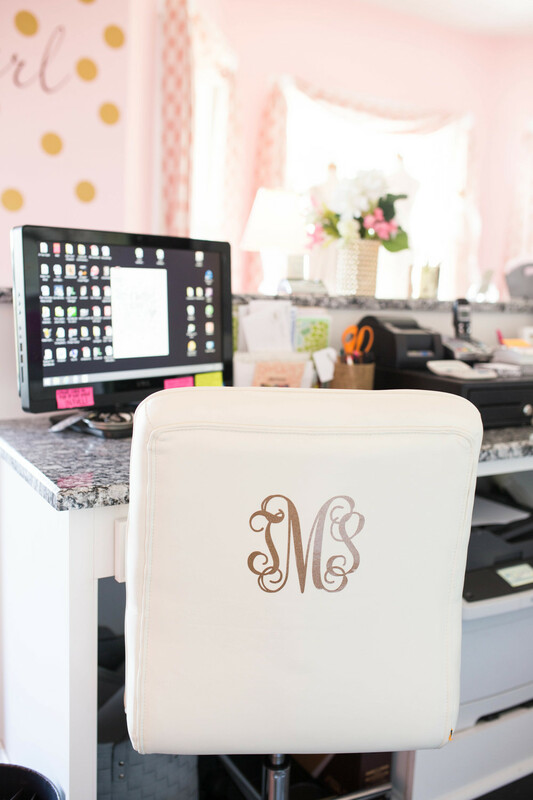 We were inspired by our favorite Southern Weddings ladies when it came to our desk chairs! 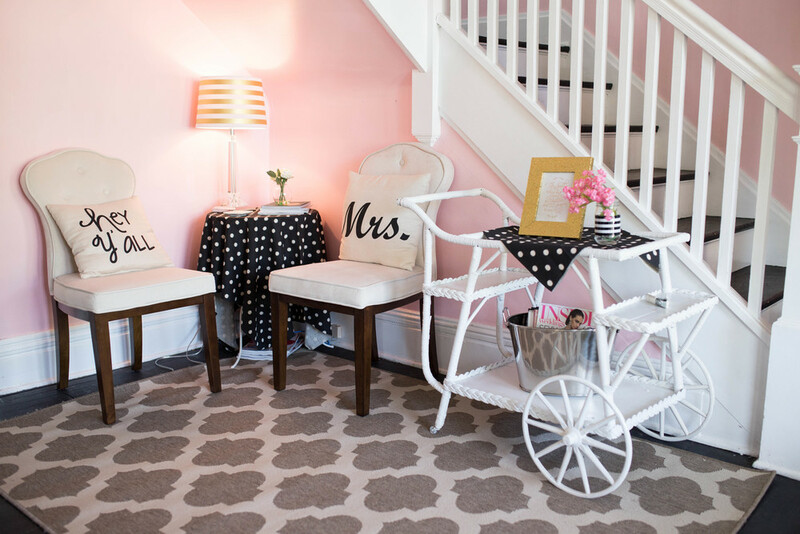 "The South" print is from The Southern Weddings shop. Go get yourself one, we love it! Our new Twirl mantra is beautifully framed on our wall. Design/Print by Thirsty Hearts Design, she's oh so wonderful! 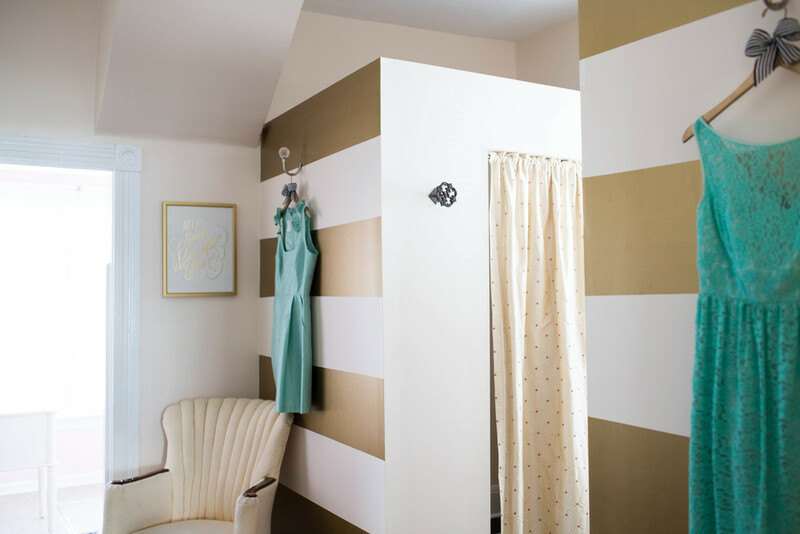 We're are OBSESSED with those gold stripes on the walls! Kate Spade would be proud, or so we hope. Ha! 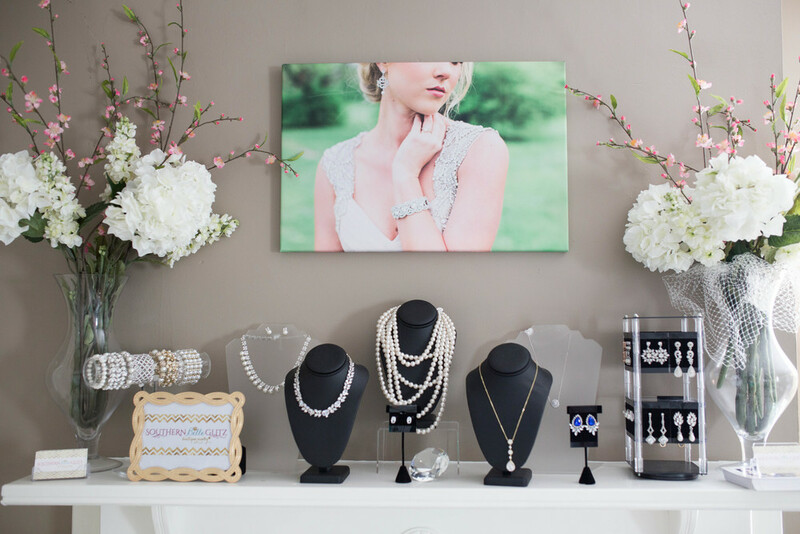 Southern Belle Glitz is selling her bridal collection here at Twirl & we are in love! Reupholstered cushions can make a world of difference! Fabric from Rag Peddler here in Lexington. And there you have it! Please come by & see it in real life sometime, we'd love that! Tara Keely Trunk Show at Twirl! Lately we have felt overwhelmed with gratitude for the work we get to do and the lives we get to be a part of here at Twirl. 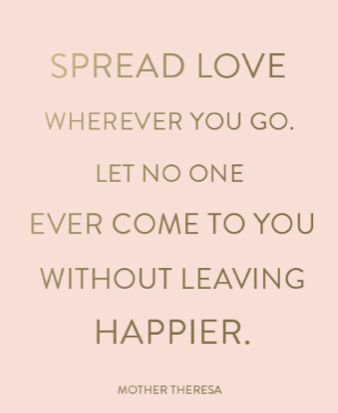 They say that giving comes from a grateful heart and we couldn't agree more. Starting this month, we want to make it a point to have a weekend at least once a month where a percentage of our profit goes to those in need or to a charity that we believe in. Kicking off our new "Twirl Gives Back" tradition, a portion of our profit this weekend is going to help send one of our very own, Miss Emily Rhoads, to Costa Rica for a mission trip this summer. We are so excited to support Emily and help make this trip happen for her! We thought it'd be sweet to have her share her heart with you all about why she's going to Costa Rica and what you'll be a part of this weekend if you're one of our special brides or bridesmaids! Who knew two words could open up a desire that rested deep in my heart, those two words have shaped my year, those two words are the start of a journey that will begin its first chapter with a trip to Costa Rica. In the last year I’ve had this thirst to go wherever the Lord wants, to leave the comfort zone that is Lexington is to me. Nothing can quench this thirst other than going and doing. It all began while sitting in a church service and the pastor said that a person in the congregation would get to serve on a mission trip and their funds were already taken care of. As soon as I heard this I started to pray, ‘PLEASE BE ME.’ I just couldn’t stop thinking about how I wanted to be that person. Until that day the desire to serve in a developing country had never shown itself in full force, but it was buried in my heart and brought to life that day in church. Unfortunately I did not get to go on that trip, but every day since I though about going somewhere but I just didn’t want to go completely alone. Fast forward about six months, I’m talking to a friend and she mentions that she wants to go a mission trip to Costa Rica but doesn’t want to go by herself. And then those two words slipped out of my mouth without even thinking; “I’ll go.” That’s all it took to get the wheels in motion to begin planning our trip. We did a lot of research and decided to travel with a group called Experience Mission for one week in July to a remote village called Shiroles, Costa Rica. We will be serving the community by helping to build homes and an education center for the village and the surrounding communities. We will also be working with local churches and leaders and helping with a children’s day camp. But what I am most excited about it getting to love on everyone I meet. There is nothing more that I want to do than share the love of Christ and be a light for him in a place that hasn’t gotten to see much of that light. We are so excited about this weekend and supporting our sweet Em! Thank you in advance for being a part of this with us! If you feel compelled to support Emily but aren't in need of a bridal gown or bridesmaid dress you're more than welcome to come by and donate to help Emily raise money for her mission trip, we certainly wouldn't turn anyone away that wants to give! We are bursting at the seams with how excited we are to be adding Hayley Paige to our collection here at Twirl! At the end of the month we will be having our trunk show with "the best of Hayley Paige" and are chomping at the bit for all of her gorgeous gowns to fill our store. We already carry her Blush line and are completely smitten with it so to add her bigger & better Hayley Paige line is as exciting as Christmas morning for us! Our love for Hayley is probably very evident but we know to those of you outside the pink walls of Twirl, you may not have a clue why our love runs deep for this special lady. We thought it'd be a good idea to introduce you all to Hayley so that you could fall in love with her just like we have and therefore your excitement for this addition to Twirl is just as much as ours. From the JLM Couture website: "Ever so eclectic, her designs capture a romantic and charming aesthetic that balances inner ingénue and sophistication. Her interpretation of worldly influences and desire to dress hopeful romantics, have provided a foundation for a fanciful and fresh take on bridal wear. Never taking herself too seriously and fully embracing the adorning history of the bridal industry, Hayley Paige develops her craft from an inspirational place of appreciation and enjoyment." Hayley's designs are reflective of her personality -- young, fun, unique, and beautiful! Her gowns are a breath of fresh air just like she is. Hayley's gowns start at about $2,800 and will go up to $4,500. So mark your calendars friends -- January 29th through January 31st for our Hayley Paige trunk show! It's going to be an amazing weekend that you certainly don't want to miss! Give us a call at 859.309.2493 and book your appointment ASAP! P.S. -- Feel free to follow along with Hayley on her Instagram (@misshayleypaige). Her feed is always full of goodness & fun!! Introducing LulaKate at Twirl Lexington!! The wait is over, Kentucky brides, LulaKate is now at Twirl! If you are not familiar with this bridesmaid line it is a MUST see. One look and you will be head over heels in love with LulaKate just like we are! With multiple price points, fabrics, skirt options and styles every bride will be able to create their perfect bridesmaid dress. Call or email us to set up your appointment to shop! The Twirl Girls are feeling festive and blessed! Join us for our first ever Candy Cane Sale for a chance to save up to 20% on Wedding Gowns and 15% on Bridesmaid Dresses!! Set up your appointment to shop now - 859-309-2493! Can't wait to shop and celebrate with you!